Almost seven years with no bishop for the dynamic and growing Diocese of the South. While there may be many good reasons for taking the slow route, six years is an extreme period of time to be in the locum tenens state (albeit with an administrator-episcopal-candidate waiting in the wings). One hopes that the synod puts out something on the topic in the next few days before people start guessing at the reason for the radio silence. (OCA) - The Holy Synod of Bishops of the Orthodox Church in America concluded its fall session at Saint Andrew House, Detroit, MI, on Friday, October 23, 2015. His Beatitude, Metropolitan Tikhon, presided at the sessions. After concluding a Church Court held on October 19, the hierarchs canonically deposed the retired Archbishop Seraphim from the status and all sacred functions of the episcopacy, removed him from the ranks of the clergy, and returned him to the status of a lay monk. Mission Planting Grants were awarded to Saint Katherine Mission, Cardiff, CA; Saint John the Evangelist Mission, Tempe, AZ; Saint James Mission, Beaufort, SC; Saint Nektarios Mission, Waxahachie, TX; and Saint Juvenaly and His Companion Mission, Wasilla, AK. The Holy Synod reviewed the text of a “Service of Prayer after a Miscarriage or Stillbirth,” which was approved for use. The text will soon be available on the OCA web site in PDF format for downloading. Very important note here. I still hold out hope that this can get some top-down, pan-Orthodox support. 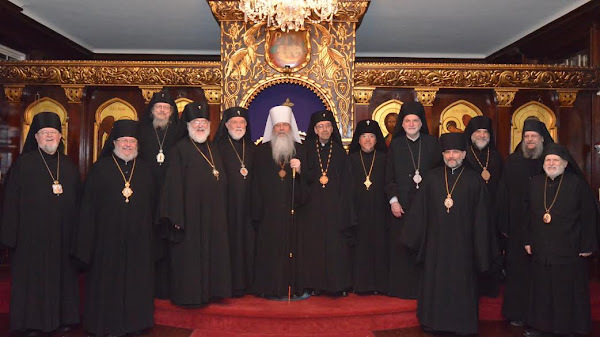 The hierarchs decided that the section on Spiritual Courts that appears in the previous Statute of the Orthodox Church in America will remain in effect until the revision of this section in the new Statute is approved. I am truly beginning to contemplate moving to another jurisdiction. It's increasingly difficult for any reasonable person to discern a valid reason for leaving the DOS widowed except out of sheer neglect and lack of pastoral care. The cynic in me thinks the delay is that the "operatives" have been unable to discover a reason for disallowing Fr. Gerasim. Sorry if I sound bitter; I just am very, very disappointed in the Synod at this. How long, O Lord! You sound, in essence, exactly like what everyone else I have spoken to has said. You're not alone. I'm glad to see that the synod is looking at miscarriage and stillbirths. Having just gone through this, I was saddened by the available prayers and services available. So much emphasis was put on the 'accidental murder' of a baby. Hopefully the available text will be provided soon and be adopted by the Church proper. I will be interested to see which service they reviewed (i.e. the source). Sadly, the miscarriage and stillbirth booklet our subcommittee compiled and wrote back in February (which was supposed to be on the agenda of the Assembly of Bishops meeting several weeks ago) didn't come up in discussions due to lack of time. We are considering publishing independently. Email me when you do! Id love to have that. Whenever it's available I will definitely post it on Lost Innocents, and on the Lost Innocents FB page.